I recently bought a pristine, low mileage, one owner Lincoln Town Car - from Florida, where else? It is a Designer Series that is the top of the line equivalent to the Cartier and Ultimate series that came in previous years and the Signature Limited that came afterward. I bought it for many reasons: reliabilty, ease of maintenance and repair, great travel car, but mainly because I wanted to go old school with the last body-on-frame RWD American luxury car. There is nothing quite like them and for better or worse there will never be anything like them again. Why the 2006 Lincoln Town Car? I bought this Lincoln recently partly because of growing concerns about a Park Avenue I own. Although there are only 87K miles on the Buick, I've become increasingly concernced that the car is really not service-friendly. I.e., it cost me over $1000 to change out a water pump and serpentine belts. (The engine has to be taken off the engine mounts to install the belts!!!) Makes me apprehensive about long distance travel and ease of repair should something break. 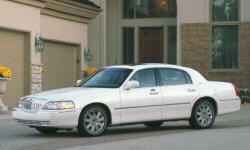 The Buick is a great car otherwisie, but this Lincoln Town Car is in another class entirely. First of all, the only word to describe operating it is "creamy" - the quietness, the ride, the lack of vibration, the way the controls operate, etc. Plus, the V8 is infinitely more refined than the Buick's V6. (Is it true that Ford and Lexus collaborated on that engine design - thus the very similar 4.6 V8 in the first Lexus LS460?) My mileage is about 10% less than the Buick, but I pay 10% less for regular gas vs. premium so it's a wash. A friend just bought a pristine, low mileage 2001 Cartier Town Car. I had never really paid much attention to Town Cars previously, but examining it closely I was impressed enough by it that I decided to get one of my own. Looking under the hood, everything is easy to get to and service-accessibile - except the trans dipstick. The same basic car had been in production since 1998, and many mechanical bits were also used in the previous generation Town Car. Any defects or deficiencies had long since been ironed out and addressed by the time my 2006 example was built. After some research, I determined the sweet spot for Town Cars are the years 2005-2007. Aside from the extra technology and features available by that time, these were the last of the Town Cars built at Wixom, a flagship Ford assembly plant originally built to produce the Continental Mark II. Production of Town Cars was moved to Canada in 2008 so the remaining model years are good, but supposedly not quite up to the assembly standards of the Wixom cars. Therefore, the 2005-2007 models are some of the best-assembled, most defect-free and reliable models of a car that already had a reputation for bulletproof dependability. As far as maintenance and repairs go, many people - myself included - are a little wary of older cars with air suspension. We've all seen too many Lincolns and Mercedes on the ground. However, a quick review of the service manual procedures and a search through Ebay auto parts shows how simple and inexpensive it is to repair anything that might afflict the air suspension. Even replacing the air springs is a do-it-yourself job for most anyone with a modicum of mechanical ability. Unlike with the Buick (take the engine off its mounts to change a fan belt, really?!! ), I feel fully confident of my ability to maintain and repair 99% of everything that might need servicing with the Lincoln. I am very impressed with the workmanship of this car. I have yet to find a ragged edge anywhere, including under the hood and in the trunk. Everything fits well with tight panel gaps seen everywhere inside and outside the car. Materials are of generally high quality and all the switchgear moves and operates with an expensive "ball of silk" fluidity (as Rolls Royce describes it). " There is also the indefinable quality "feel" of the car - the way it sounds, the way the controls operate, the impeccable ride, etc. I bought my car because of its color - Black Cherry. It is a deep, dark red. I did not want black and have it look like a car-for-hire. The Pearlescent White was a distant second choice, but the other 'shades of dirt' colors (greys and tans) left me cold, so when I found the right car in the right color my decision to buy it was easy. The Designer Series for 2006-2007 was a short-lived model designation that was the equivalent in upgrades to a Jaguar Vanden Plas of that era. Like the Vanden Plas, it had special interior and exterior trim - chrome B pillars, 18-spoke chrome wheels, unique upholstery - and included most every option as standard. Another advantage to the 2005-2007 models is the additional technology that became available vs. the previous generation 1998-2002 models. Already equipped with the usual array of power assists, heated memory seats, trip computer, etc. my car has a slick THX touchscreen AM/FM/CD audio / navigation system. Especially trick is when you touch a button on the lower corner of the touchscreen and it motors down to reveal the 6 CD changer behind it. My car also has the HID xenon headlights which are so much brighter than the Park Avenue's halogens. Another luxury feature is the trunk. Not only does the remote unlatch and open the trunk, but another press of the remote closes and latches the trunk lid. Keyless Entry has been a Ford feature for years, but I came to have great regard for the system when I locked my keys in the car. I punched in the code on the keypad on the door and the door unlocked. Nice. Another feature of the second generation 2003-2011 models is the cupholders. 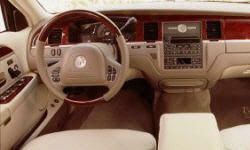 Prior to 2003, Town Cars had them on the pull-out ashtray beneath the A/C control panel. Fine, but you could not access the control panel when the cup holders were in use. Beginning in 2003, the cupholders are below an upholstered section at the front of the center seating position that pivots out to reveal the holders and a small tray. Only on the Designer Series is there a similar arrangement for the rear seat - a feature that also allows for full length center armrest upholstery. (Other standard wheelbase models have the armrests cut short by the cupholders embedded in the end of the armrest.) Unique upholstery design is also a feature of the Designer Series. Town Cars from 1998-2011 all share two basic upholstery designs. The 2006-2007 Designer Series added a third design during those two years that featured broad sections of solid leather with shirred center panels. It is the only Town Car upholstery design with contrast welting: medium taupe welting with the magnolia color seats - white welting on interiors in charcoal leather. The Designer Series is also the only model with adjustable rear seat headrests. A Town Car is rightly known for its quietness. And it is not just the quietness of the engine, but the quietness of its progress down a road. There is little road noise of any kind and no wind noise. The suspension swallows most every kind of road imperfection quietly and unobtrusively. There is a great feeling of refinement, solidity, and substance to the car. The THX audio system in the car has a speed-compensating volume adjustment, but it really is unnecessary. Road and mechanical noise are almost the same at idle up to 70mph. Why Not the 2006 Lincoln Town Car? The front seats are lovely to look at, but are basically flat sofas and not quite as supportive as I would like. They adjust infinitely, and along with an adjustable steering wheel and adjustable pedals you can get a good driving position - but I have to give Buick the nod for a more orthopedically-designed and cradling seat. I also would wish to be able to defeat the feature that automatically moves the seat back two inches when the key is removed from the ignition. Can't be done without an expensive dealer visit to download new softare into the door control module. My car has navigation combined with a radio and CD system. Works well and was state of the art when new (as well it should be since it cost $3695!! ), but compared to navigation systems in new cars the graphics and functionality are beginning to show their age. Also of concern is that the last update for the maps was published in 2010 and there will be no more. This is something all car owners should consider for their expensive factory-installed navigation systems. What kind of manufacturer support will there be for map updates over the coming years? It's an issue to consider until all new cars are like the Tesla where updates are automatically downloaded on a continuing basis. Summary: If you live and commute where roads are broad and parking is always plentiful (as I do), a Town Car is hard to fault. Comfort is tops, ease of operation can't be beat, maintenance is easy and inexpensive, and durablitiy is legendary. But more than that is the experience of driving a classic American luxury liner. It is an experience that is slowily disappearing as luxury cars become tiny 4-cylinder legislation-mandated clones of one another differentiated only by the badge on the grill. A Town Car will always be a symbol of another era, an era of expansion and prospertity. As the American Dream continues to fade and shrink, living large in a Lincoln is a nice antidote.